When it's cold in the morning, the last thing you want to do is get out of bed. But having a rotation of cute winter outfits ready to go will at least ease the pain associated with chilly mornings. If your pile of sweaters and closet jammed full of coats don't leave you feeling particularly inspired, don't stress—we're here to inspire you to wear your winter staples in a whole new way. Below, we've rounded up 24 easy (but cool) winter outfits to keep in your arsenal. Ranging from colorful to just plain cozy, these ensembles will offer you the warmth you need when it's icy out but won't leave you feeling like you've given up your sense of style. Style printed pants with a simple color-contrasting sweater. If needed, add long underwear underneath. Style a turtleneck with a sleek blazer and high-waisted jeans. 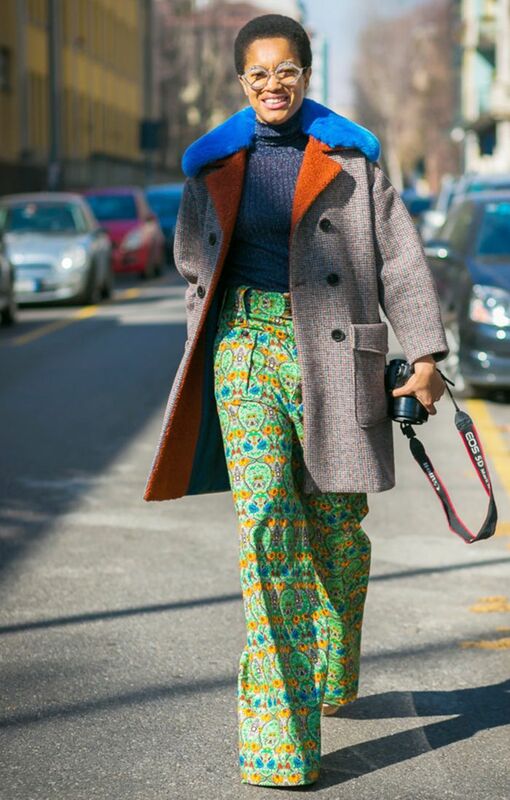 While statement boots and a statement coat may seem like a bold combination, they go great together. A leopard-print jacket instantly dresses up a pair of casual jeans. Wear white pants all season long by styling them with standout pieces like a bold silver jacket. Let bold boots peek out from under a trench coat. Try cords and a bomber jacket for a warm combination that still feels fashion-forward. Go for tonal dressing in head-to-toe purple. Cozy up in a matching knit set, and if it's especially cold, add a jacket on top. Finish off a casual jeans-and-sneakers look with a plaid coat. Style plaid trousers with a simple cozy sweater, and finish things off with a structured coat. Wear your favorite loafers with warm statement socks. Layer a turtleneck under a sleeveless top to give it a season twist. Stand out with a pop of pink to finish off an all-black outfit. Pair a statement tee with a maxi dress; then add warm layers to gear up for colder temps. Play with contrasting materials and wear vinyl pants with a teddy-bear coat. Layer a sweater over a slip dress, and pull on thigh-high boots to add an extra layer of warmth. Make your wildest coat the anchor of your outfit. Throw a blazer and boots on with your favorite dress. Try a full suit on for size; then add a polished coat over the ensemble to finish it off. Go bold and do some serious print mixing. Coordinate your look from head to toe. Style a slouchy knit with tailored trousers for days when a coat isn't totally necessary. Don't shy away from a pop of color.